Game Information: This game is set on a simple 3 reel and single payline structure, making it incredibly easy to play. But the game should not be underestimated- there is a bonus game, AutoPlay, betting options and the execution of the sounds and graphics are just out of this world! Alchemist’s Lab is set in just that, the lab of an Alchemist- with potion bottles and spell books littered everywhere. 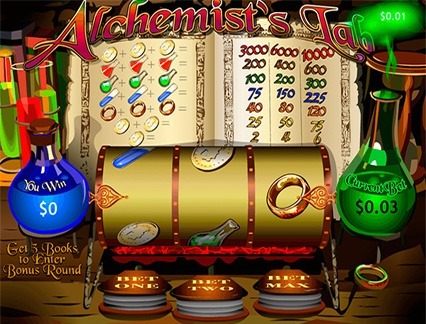 The scene is set for magic to happen, and for you to start turning spins into gold- just like a real alchemist! Alchemy is the intriguing and ancient art of purifying objects. One of alchemy’s most famed practices was the method of transforming minerals into gold. There are many myths and legends surrounding alchemy, and the mysterious art makes an excellent theme for this awesome pokie from Playtech. Playtech is definitely one of the world’s top software developers and we have gotten used to them producing fantastic casino game after fantastic casino game. 3 reel slots are the simplest slots to play. All you need to do is choose how much you’d like to bet and then spin the reels. The table above the reels will display all the symbols and their correlating payouts. The Blue Potion bottle on the right of the reels displays the amount you win if you do win and the Green Potion Bottle on the left of the reels displays your current bet. The betting options are incredibly easy and you can choose whether you’d like to choose Bet One, Bet Two or the Max Bet by choosing one of the three buttons below the reels. Your total will be displayed in the top right-hand corner for your convenience. Bonus Symbol: The Bonus Symbol is that of a Spell Book, and upon landing 3 in a row, you’ll activate the exciting bonus game. 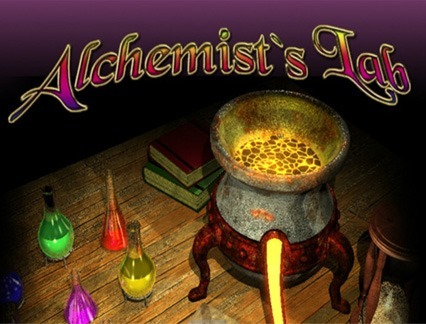 3 reel slots are characteristically boring in terms of graphics, and tend to be old-fashioned, but Alchemist’s lab is different. The graphics are truly remarkable and have a realistic look without being too detailed and over the top. The use of bold and bright colours have definitely aided Playtech’s plight for the perfect 3 reel slot. The backdrop of the reels include different-coloured potion bottles, all piled about a darkly lit wooden desk in a study. It immediately evokes feelings of magic and mystery without even trying. The reels themselves are set upon what looks to be a mystical object and the info table is set out on a spell book of sorts. The sound in this game adds further intrigue, and the mystical piano music in the background is just what a wizard, or shall we say alchemist, would listen to. Jackpots are always a major talking point when it comes to pokies. It’s all fun and games to spin the reels and enjoy the bonus rounds, but the question of how much you stand to win will always lurk in the back of players’ minds. 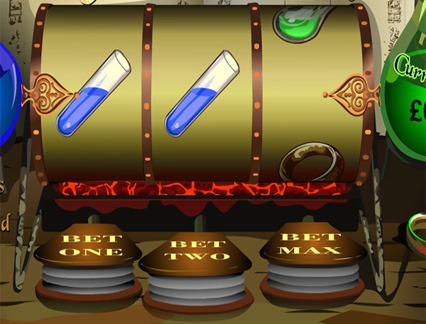 In Alchemists’ Lab there are actually 3 Jackpot levels that correlate to the different betting levels. You can either wager $1, $2 or $3 per spin and that choice will determine how much you win if you do happen to strike it lucky and win the jackpot. You’ll hit the jackpot if you happen to line up 3 gold coins on the reels. If you had bet $1 on this spin, you will win 3000 coins. If you bet $2 on the spin, you’ll win 6000 coins and if you bet $3 you will win 10,000 coins – which works out to a possible $30,000! This game stays true to its name and provides a jackpot that leaves you truly impressed. Most 3 reel games usually don’t offer much in the terms of bonus games, and if they do it is usually standard Free Spins. But Alchemist’s Lab is different in that their bonus round is exciting, unique, theme-relevant and visually appealing! In order to gain access to this special bonus round, you’ll need to line up 3 books on the reels. Once this happens, you’ll be transported to a new backdrop. Here you’ll be presented with seven mystical potions. You need to choose three potions and these will be mixed together in order to make a gold ingot. The bigger this ingot is, the more coins you’ll win! Your winnings from the bonus round will be added to your total.